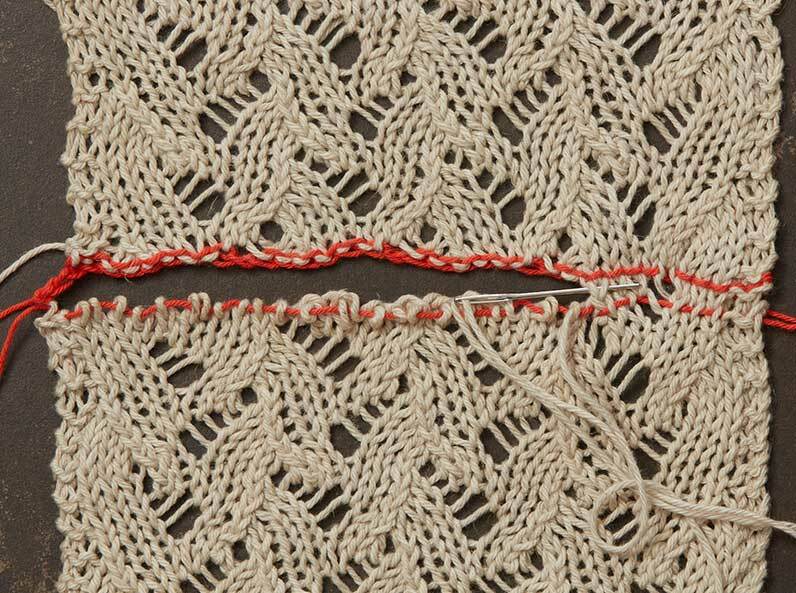 Ready for Pattern #4 in our series on grafting two-sided lace? Joni is ready to take you to the next step! 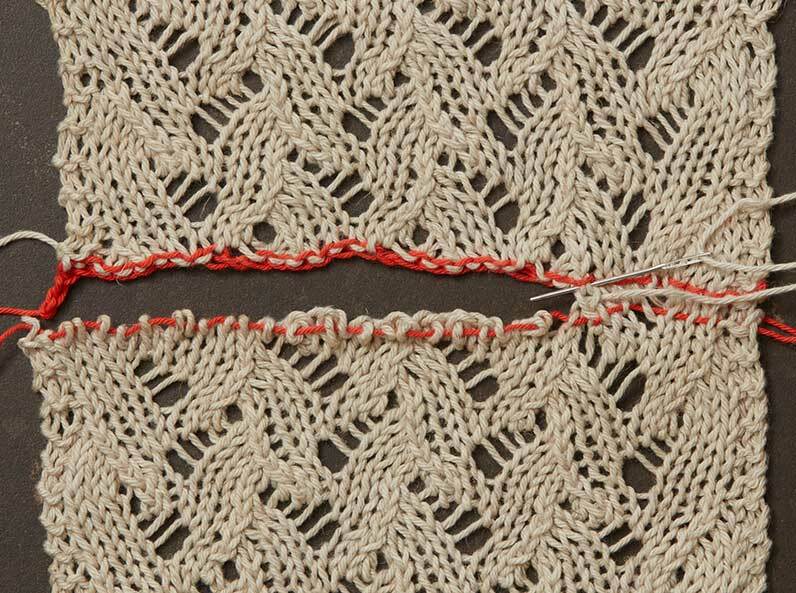 Mastering the lace grafting techniques she has covered in this series will give you the aptitude to turn this practice pattern into a gorgeous lace cowl. 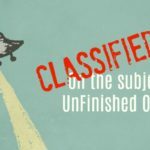 Read on, and remember – never stop learning! 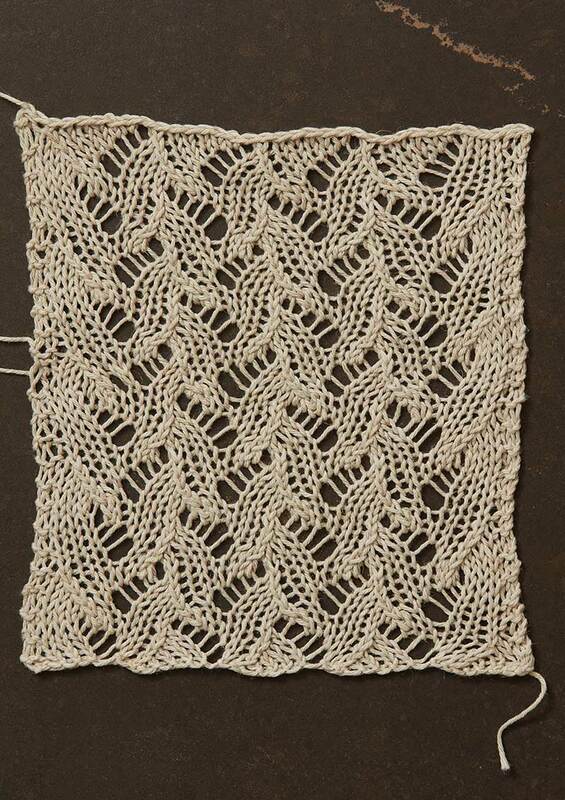 Lace Pattern 4 is worked over a multiple of seven stitches. I worked my swatch over 35 stitches. Four sequences are used to graft Pattern 4: Sequences A, C, F, and J. 1. With crochet hook and cotton waste yarn, chain 41 sts. Break yarn and pull tail through last st.
2. Turn chain over so the bumps in the back of the chain are visible. With knitting needle and working yarn, beginning in 3rd st from last st of chain, pick up and knit sts in the chain, placing the yarnovers from Row 8 of the chart as foll (reading chart Row 8 from left to right, counting the decrease symbol as one picked-up st): pick up and knit 2 sts, *pick up and knit 6 sts, yo and skip a chain; rep from * 3 more times, pick up and knit 5 sts—35 sts. 1. 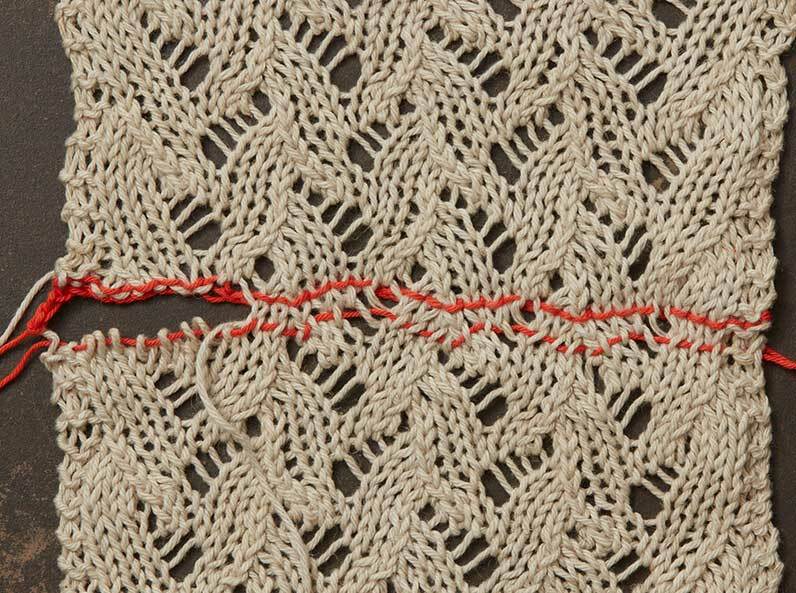 With crochet hook and cotton waste yarn, work 35 chain sts onto a knitting needle. 2. 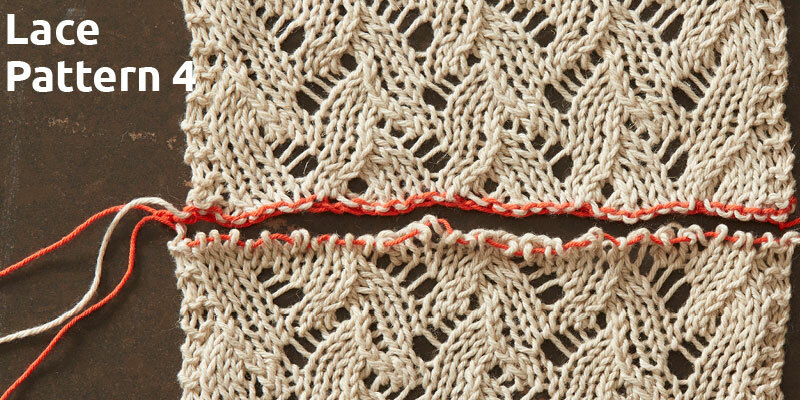 With knitting needle and working yarn, work as foll: k2, *k6, yo, drop a chain st from needle; rep from * 3 more times, k5—35 sts. 1. 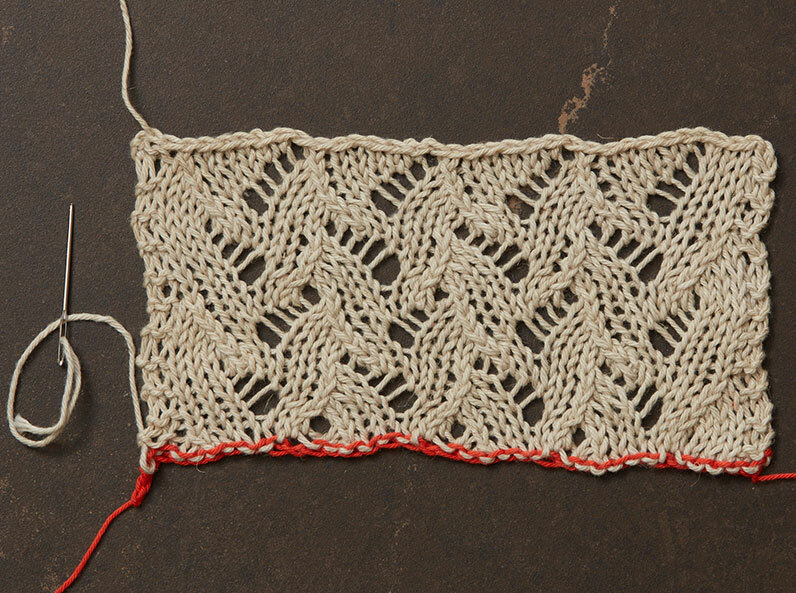 With cotton waste yarn, cast on 31 sts (add 6 sts for each additional repeat). Work in St st for about 1″, ending with a RS row. Break yarn. 2. 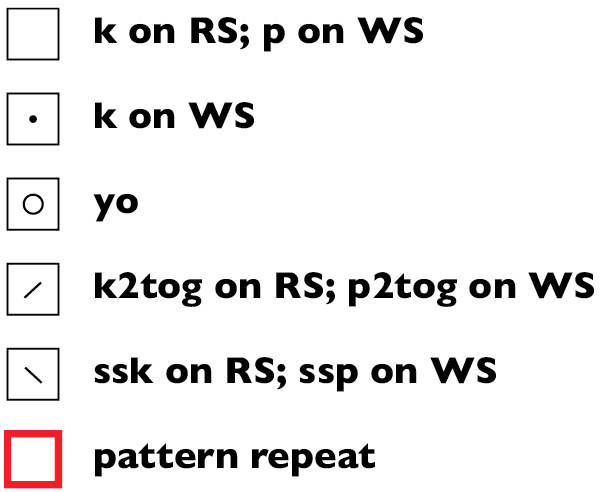 With WS facing and working yarn, k2, *k6, yo; rep from * 3 more times, k5—35 sts. 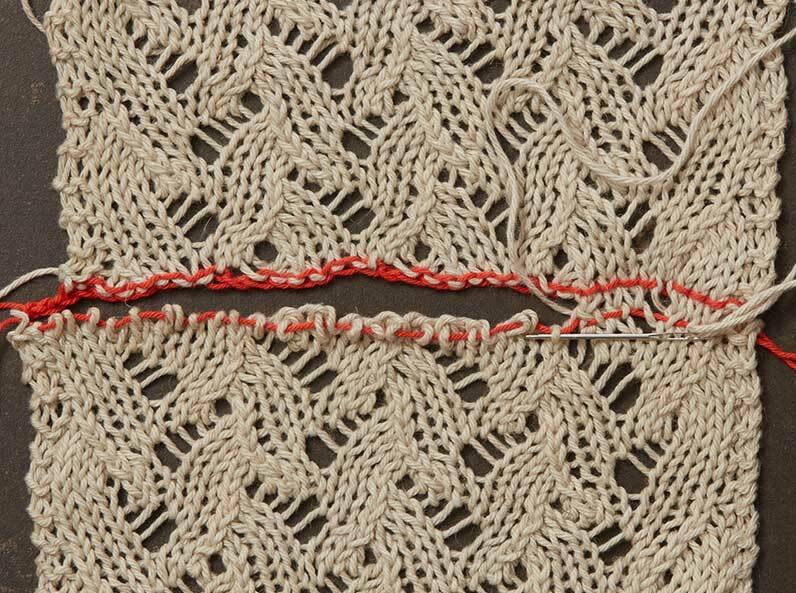 Work Rows 9–10 of Pattern 4 lace chart once, then repeat Rows 1–10 as desired. Bind off all sts. 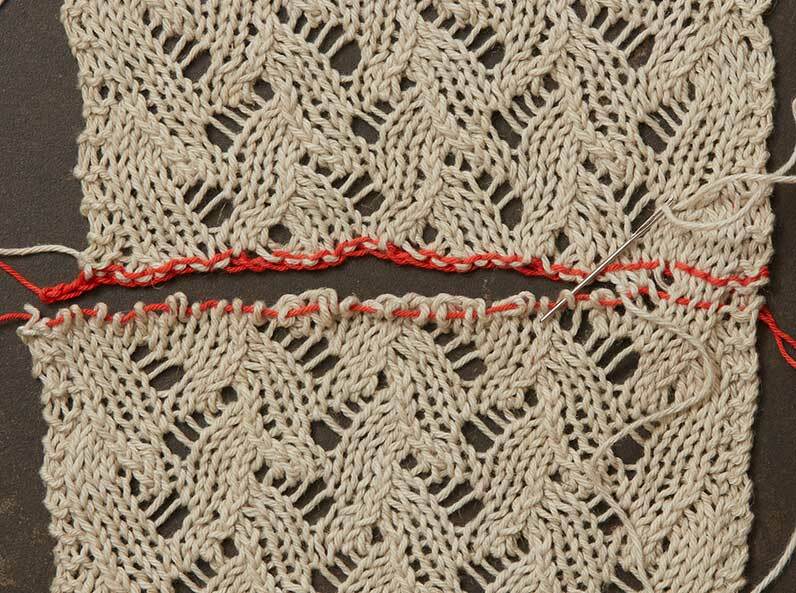 For the second part of the swatch, cast on 35 sts (not provisionally) and work Rows 1–10 of the lace chart as many times as desired, ending with Row 6. 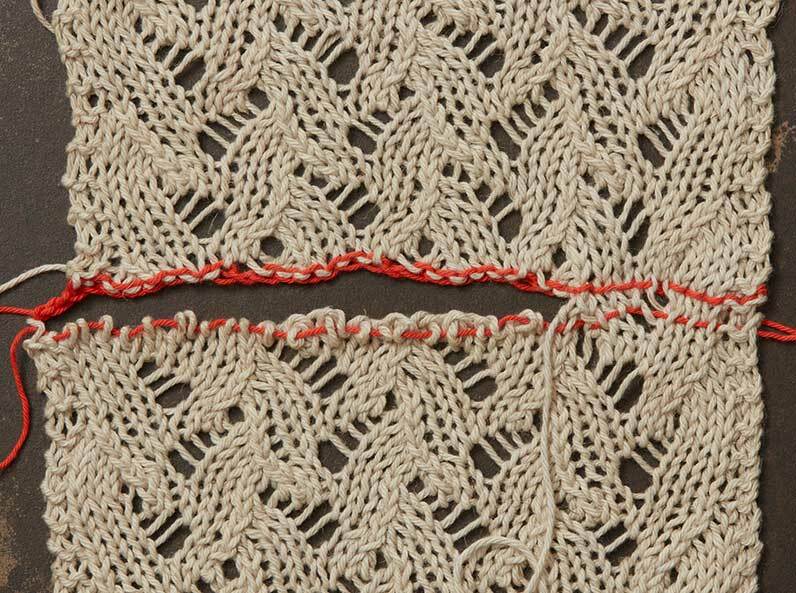 Break the yarn, leaving a tail about 5 times the width of the swatch for grafting. Thread the working yarn onto a tapestry needle. 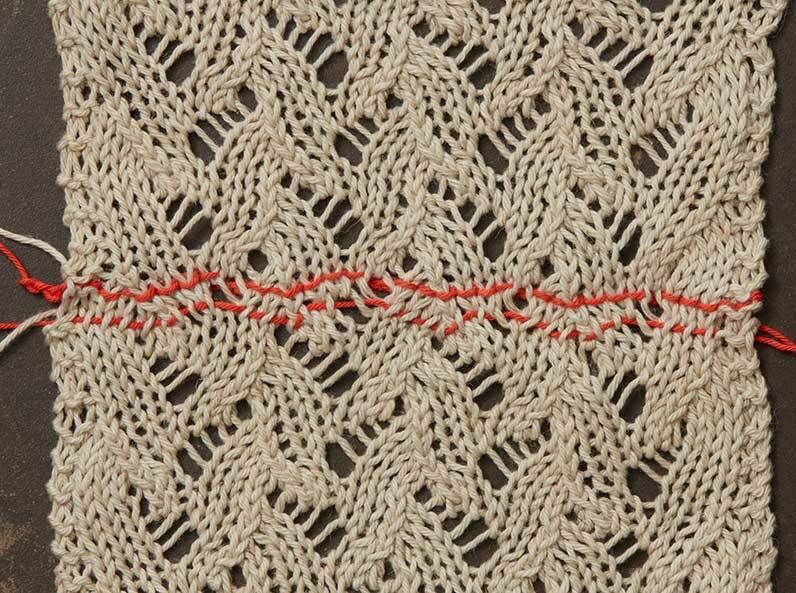 As before, make sure to use the half loop at the very edge of the upper piece for Step 2 of the first sequence or the grafted stitches will not align correctly with the stitches on the upper piece. 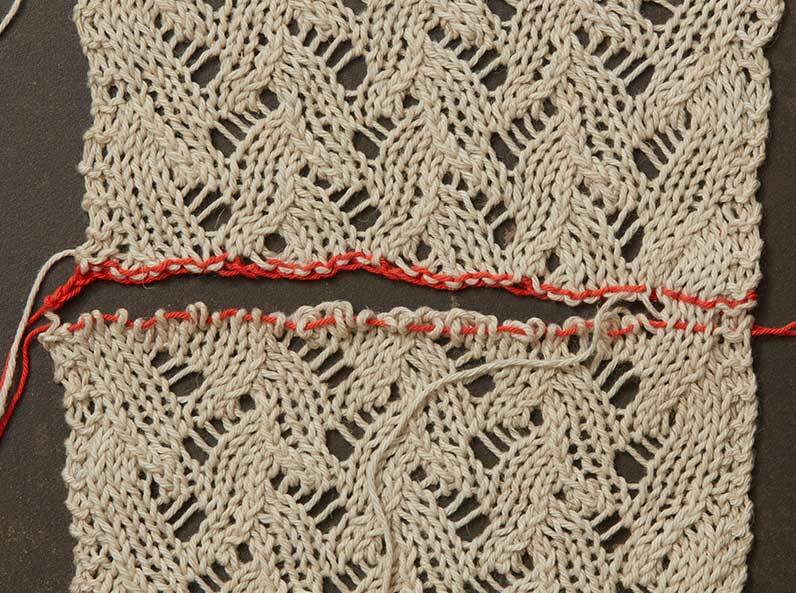 This completes the two-stitch garter border. The last Sequence A ends just before the first yarnover on the upper piece. Each repeated set of sequences begins with a yarnover on the upper piece, so you’ll know you’re on track if a set of sequences ends just before a yarnover. Work Sequence F on the other side of the yarnover on the upper piece that begins the repeated set of sequences. Work Step 1 of Sequence J, inserting tapestry needle purlwise into second st on lower piece. Work Step 2 of Sequence J, inserting tapestry needle purlwise into first st on lower piece. 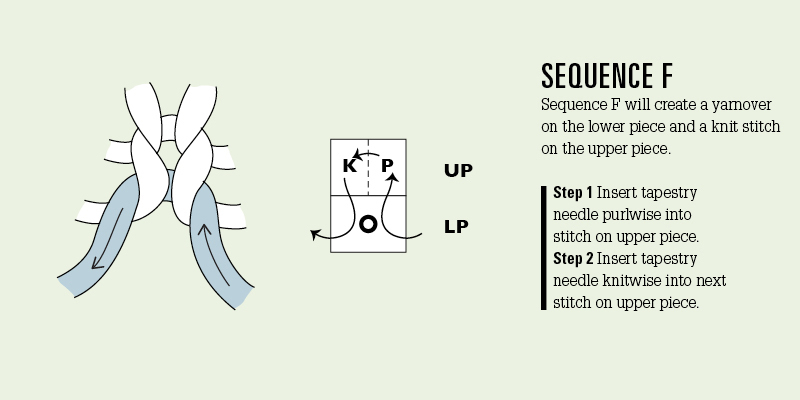 Work Steps 3 and 4 of Sequence J, inserting tapestry needle purlwise into st on upper piece, then knitwise into next st on upper piece. 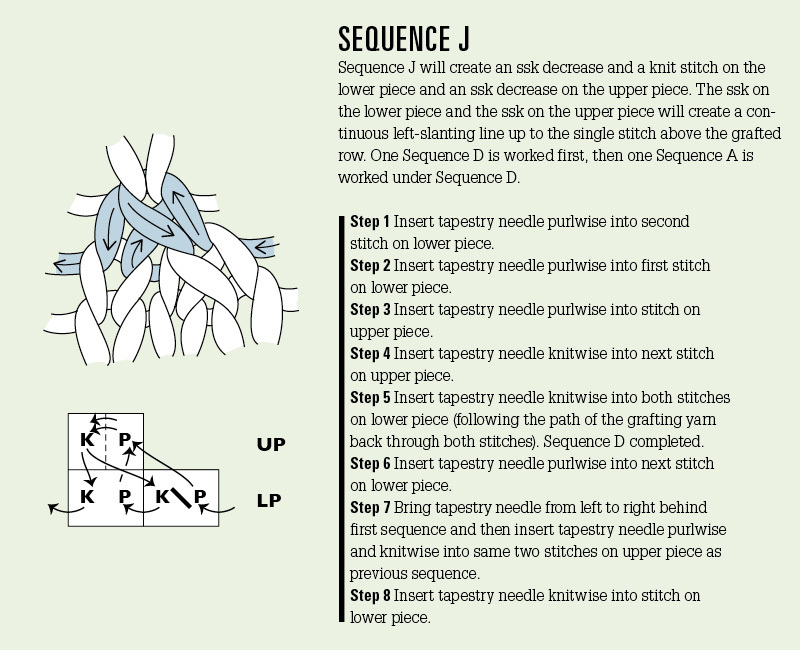 Work Step 5 of Sequence J, inserting tapestry needle knitwise into both sts on lower piece (following the path of the grafting yarn back through both sts). 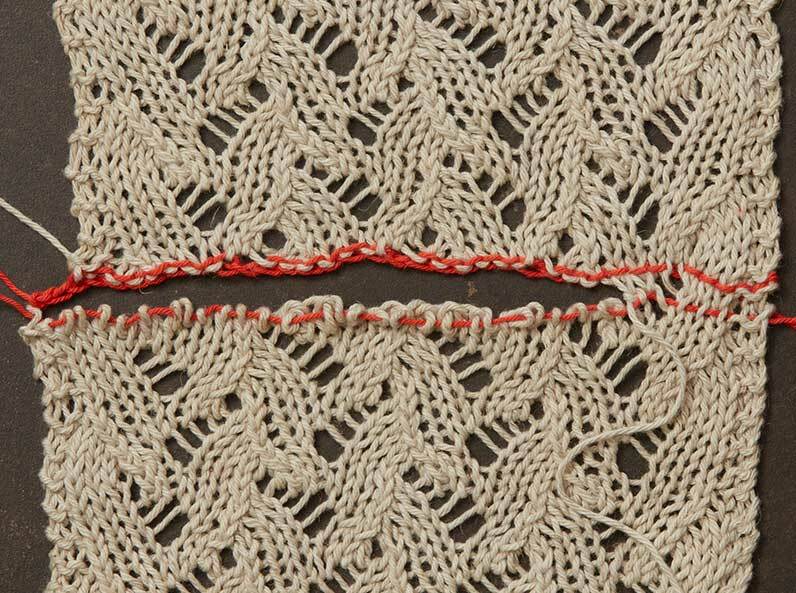 Work Step 6 of Sequence J, inserting tapestry needle purlwise into next st on lower piece. Work first part of Step 7 of Sequence J, bringing tapestry needle from left to right behind last sequence. Work second part of Step 7 of Sequence J, inserting tapestry needle purlwise, then knitwise into same two sts on upper piece as previous sequence. Work Step 8 of Sequence J, inserting tapestry knitwise into st on lower piece. Note that the grafted left-slanting decreases align with the decreases above and below. This ends the first repeated set of sequences. 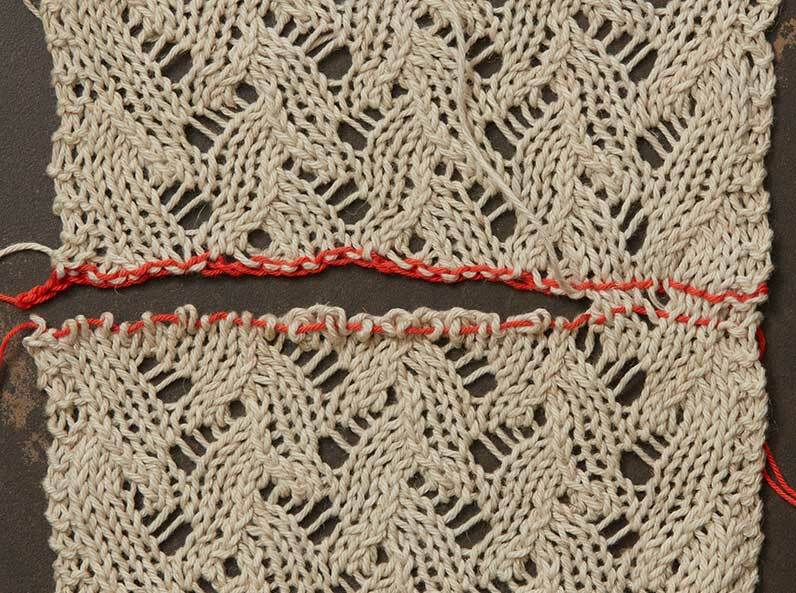 The last Sequence A ends just before the yarnover on the upper piece. Second set of repeated sequences complete. 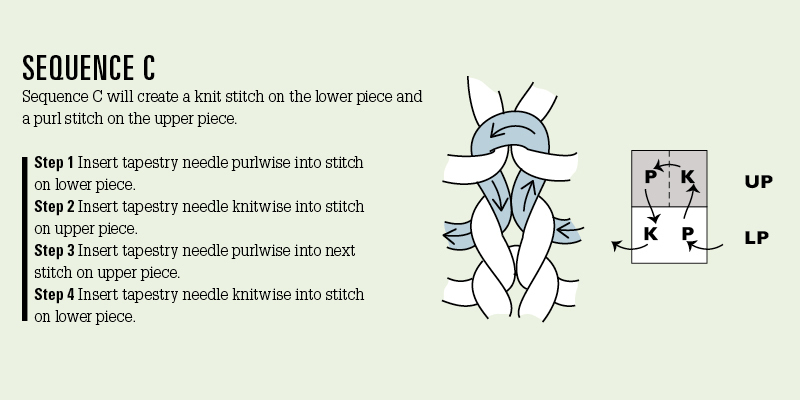 Remember to work each Sequence F on the other side of the yarnover on the upper piece. Third set of repeated sequences complete. Fourth set of repeated sequences complete. 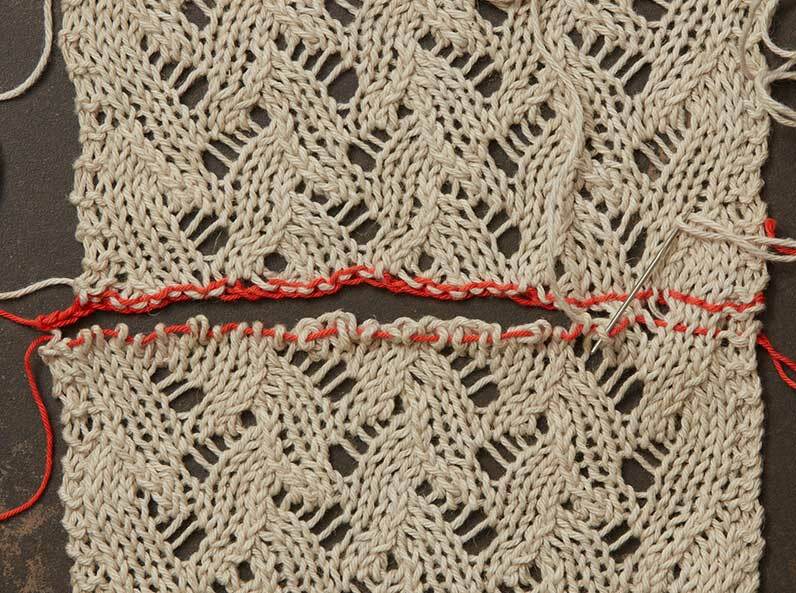 Remove the waste yarn and block the swatch to even out the grafted stitches. Any of the patterns in this series can be made into a lovely cowl. For this cowl, I used Shibui Cima (70% superbaby alpaca, 30% fine merino wool) in color #2031 poppy and cast on 70 stitches. 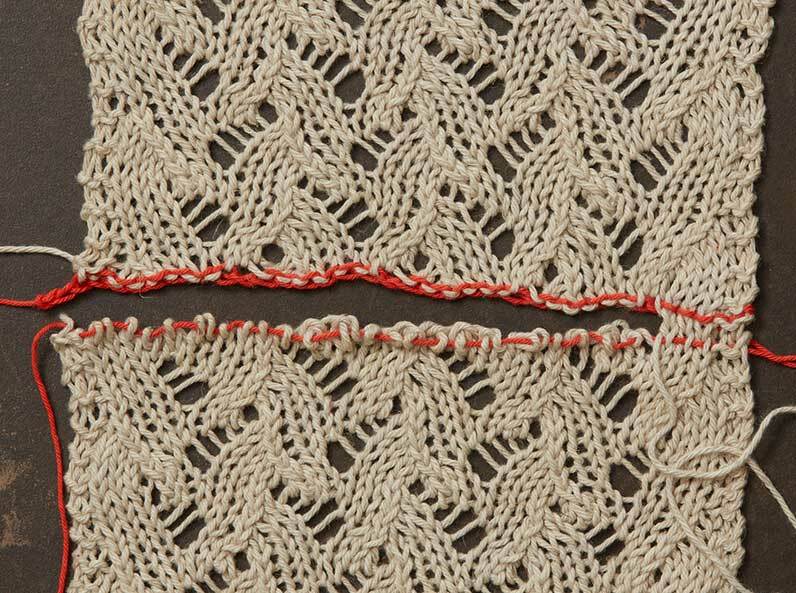 Find More on Lace & Lace Grafting! 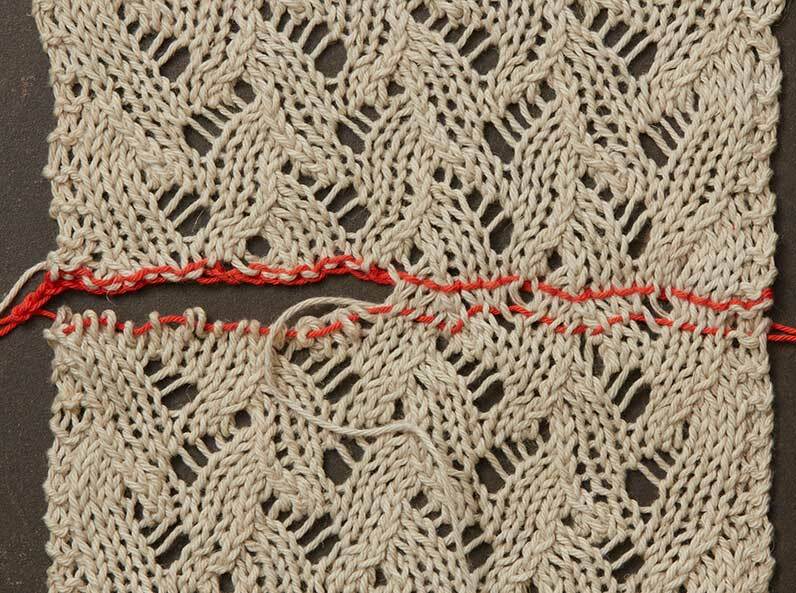 Hello Joni, I just came across your lace grafting series a few days ago. Please accept my many thanks for your wonderful and very informative posts. I feel so fortunate that I was able to read it at a very present time! A little reason for my enthusiasm: several years ago, being a very novice self-taught-via-internet knitter (that time I was using self-improvised circular needles with bamboo sticks and string because circulars are not readily available where I am) I ambitiously took on Eunny Jang’s Print O’ The Waves stole. With black crochet thread #10 and improvised 5mm (i think) circular, I was able to finish in 8 months (I have kids, yeah). I did not expect it to end up huge! 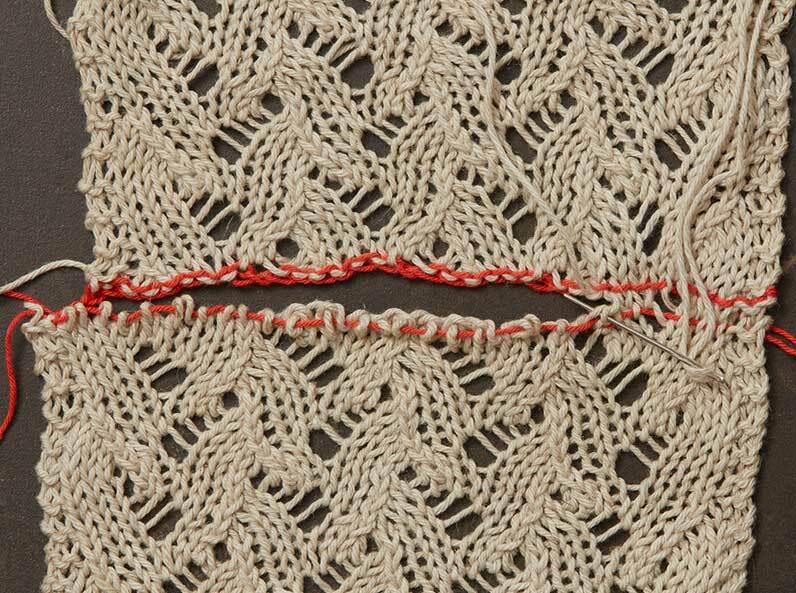 I had the same sentiments as Eunny in her old blog regarding the grafting of the two halves–the plain knitted look of the graft was frustrating to look at, but as the pattern repeat was asymmetrical, it had to do. Visiting my grandma a year later, she liked it so much but the perfectionist in me reluctantly told her that I would make her another one again, in a better yarn and hopefully find a way to graft nicely or settle with continuous pattern that wasn’t symmetrical in the middle. Sadly she passed away before I was even able to start another one, and so I just laid the whole thing to rest, buried the stole with her. And now, I see that there indeed is a way to make that graft beautifully! With heavy heart I shall not make the stole pattern ever, but I am not afraid anymore should I come across a similar thing. I WILL teach myself your grafting method. 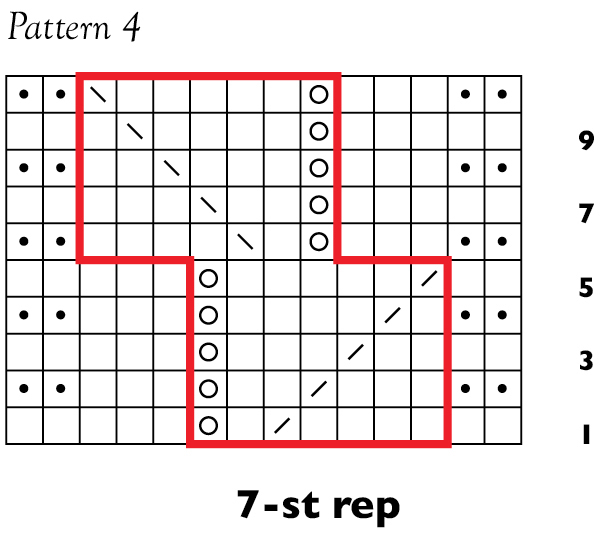 I wonder, will it also work for patterns with asymmetrical/shifting repeats like the waves stole? Or certain adjustments needed? Some pattern modification to make it possible? If you do take this on, I would be very pleased. Kindly let me know how you did it, if ever. Sorry for the over-long comment, again, thanks so much! Eunny’s Print O’ The Waves Stole is one of my favorite patterns! 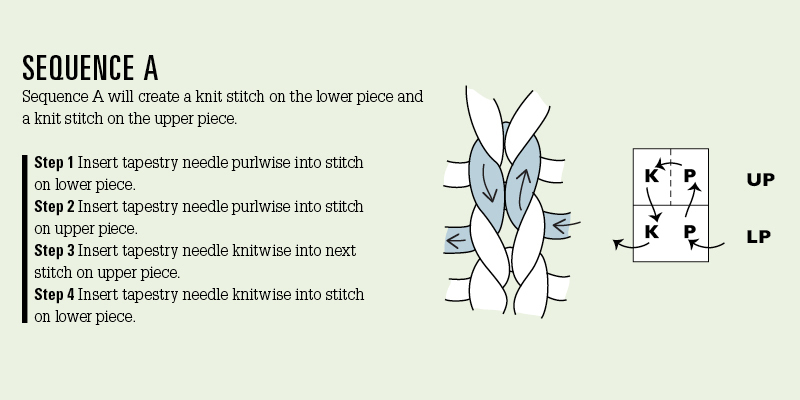 There are actually two different types of grafting used in that pattern: Top-to-top grafting (to join the two halves of the center panel) and top-to-bottom grafting (to join the end of the edging to the beginning). Truthfully, if I were making this I would work the center panel all in one piece, rather than graft it in the center, because there’s no way to graft that particular pattern without the join being at least somewhat noticeable (and the visible seam at the center back would bother me more than the fact that the two ends are not a mirror image of each other). 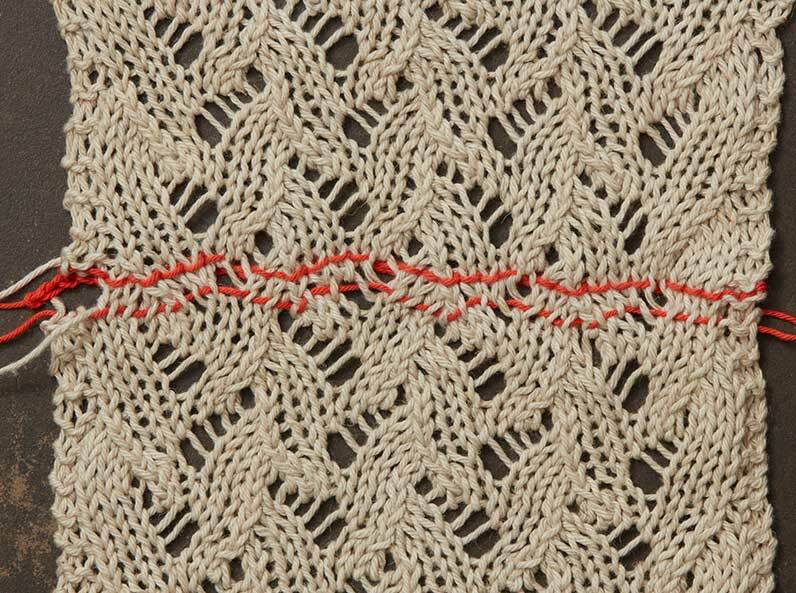 The grafted seam will be visible for two reasons: First, you’re grafting the tops of two pieces together, which will result in a half-stitch jog in the pattern where the live stitches meet. This jog is unavoidable with top-to-top grafting (but not with top-to-bottom grafting). 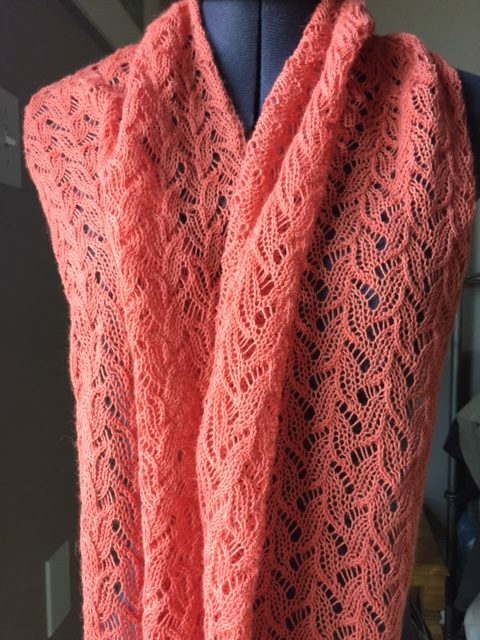 There are ways to minimize the jog and make the pattern look almost continuous, but that’s not really possible with this pattern because of its asymmetry. 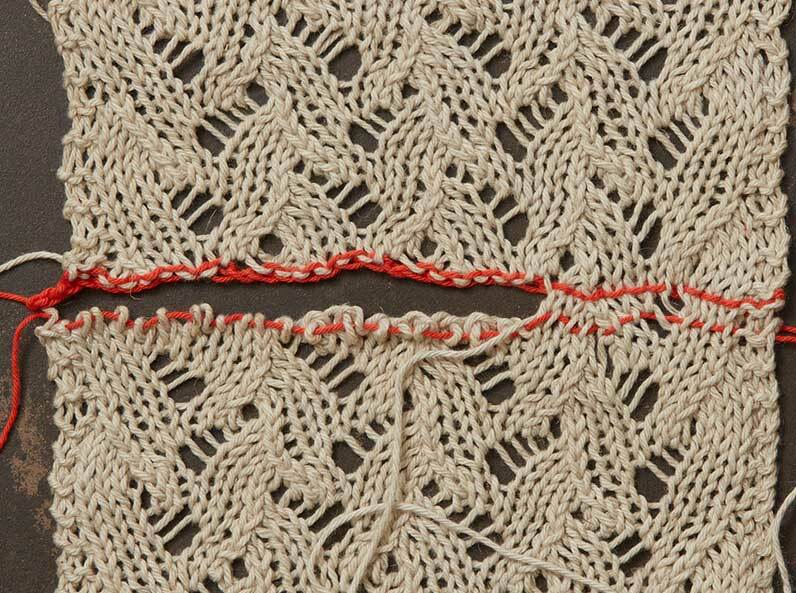 It is, however, absolutely possible to graft the edging invisibly (with no jog) because it’s worked top-to-bottom. 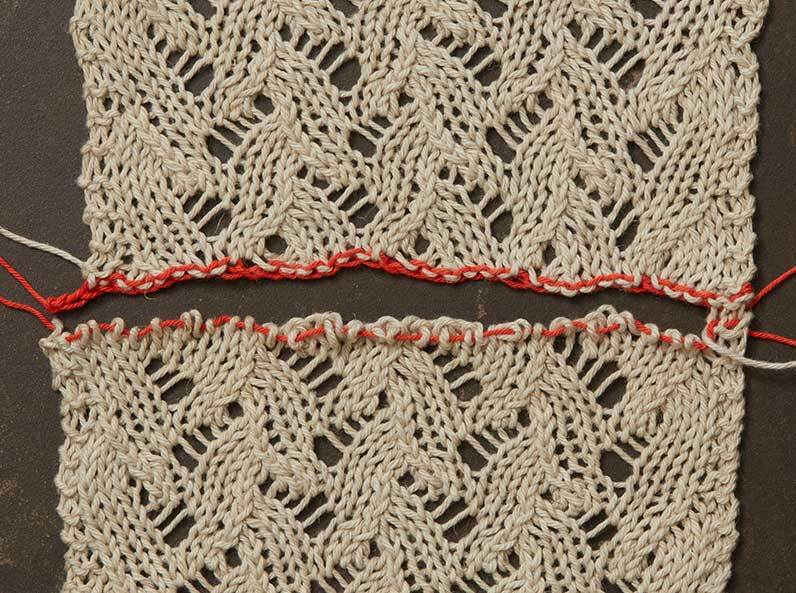 As it happens, my next series is going to be all about how to graft lace edgings.